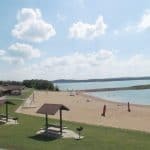 Easy Access for Table Rock Lake Swimming! 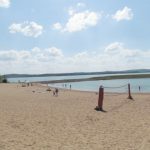 Many campgrounds and resorts found around the Branson area of Table Rock Lake offer swimming spots on the lake, but Moonshine Beach is far more expansive and can make visitors feel like they’re on an ocean beach. 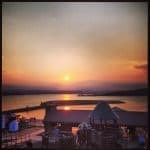 Because Table Rock is so large, gazing across the lake from Moonshine is awe-inspiring; because it’s a clear, fresh body of water, there’s no need to worry about all that ocean salt. 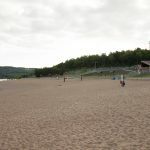 Moonshine is the only public sand beach found on the lake, and it offers plenty of the amenities you expect to find when you spend a day at the beach; picnic areas, grills, drinking water, restrooms, a playground, a food vendor, and a volleyball court. There are also group shelters that can be reserved, and a handy boat ramp for fishing and water sports excursions. 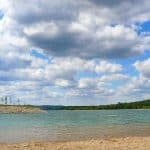 Around the Moonshine Beach area, there are acres of beautiful oak and hickory trees, and spring-time trips are perfect for viewing the dogwood and redbud trees in bloom, making the area popular for hiking. 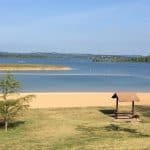 There are wonderful hiking areas at the beach site, and just across the dam, you’ll discover the Table Rock Lakeshore Trail, a paved 2.25 mile trail that runs from Dewey Short Visitor Center to State Park Marina. Because the trail is paved, it’s easily accessible for people with walking aids or wheelchairs. Parking at the beach is limited; if you’re coming with a sizable group, carpooling is recommended. There is a minimal fee of $5 to access Moonshine Beach, and the current hours of operation are 9am to 8pm. The beach is located on South Highway 165: GPS information (latitude, longitude) 36.60778, -93.31 and 36⁰18’36″W. 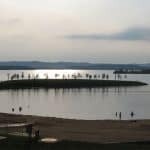 The lake and areas around the lake are available to the public for swimming, fishing, picnicking, boating, scuba diving, hiking, hunting, and viewing wildlife, but off-road vehicles are strictly prohibited. Make sure you have proper licensing for fishing or hunting, including where and when hunting in the area is permitted. In addition to the Dewey Short Visitor Center and Table Rock Lakeshore Trail, you’ll find the Shepherd of the Hills Fish Hatchery nearby, a free-admission attraction where you’ll discover rainbow and brown trout in the runs outside, and a museum and visitor center inside. The Fish Hatchery keeps Lake Taneycomo stocked with trout, making it one of Missouri’s best fishing destinations. 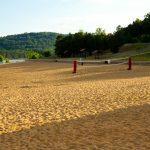 Check with Branson Tourism Center for events that take place at Moonshine Beach; sports competitions and other events can be fun to watch, but they also mean that public access for swimming may be unavailable during the hours or days these events take place. Branson Tourism Center can be reached at 1-800-785-1610 Web Code: —.